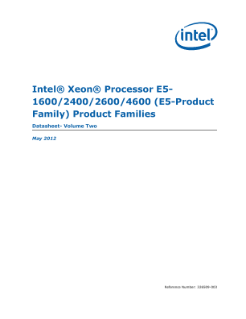 This is Volume 2 of the datasheet document that provides register information for the Intel® Xeon® processor E5-1600 and E5-2600 series. This document is intended to be distributed as a part of the complete datasheet document. Throughout this document, Intel® Xeon® processor E5-1600 and E5-2600 series may be referred to as simply the processor. The Intel® Xeon® processor... E5-1600 and E5-2600 series contain one or more PCI devices within a single physical component. The configuration registers for these devices are mapped as devices residing on the PCI Bus assigned for the processor socket. This document describes these configuration space registers or device-specific control and status registers (CSRs) only. This document does NOT include Model Specific Registers (MSRs). • Point-to-point link interface based on Intel® QuickPath Interconnect (Intel® QPI). Reference to this interface may sometimes be abbreviated with Intel QuickPath Interconnect throughout this document. Note that the E5-1600 product family is for single socket platforms, thus it has no Intel® QPI links. The processor is optimized for performance with the power efficiencies of a low-power microarchitecture to enable smaller, quieter systems. Intel® Xeon® processor E5-1600 and E5-2600 series are multi-core processors, based on 32-nm process technology. Processor features vary by SKU and include up to two Intel QuickPath Interconnect point-to-point links capable of up to 8.0 GT/s, up to 20 MB of shared cache, and an integrated memory controller. The processors support all the existing Streaming SIMD Extensions 2 (SSE2), Streaming SIMD Extensions 3 (SSE3) and Streaming SIMD Extensions 4 (SSE4). The processor supports several Advanced Technologies: Execute Disable Bit, Intel® 64 Technology, Enhanced Intel SpeedStep® Technology, Intel® Virtualization Technology (Intel® VT), and Intel® Hyper-Threading Technology (Intel® HT Technology). Caesars Entertainment utiliza la tecnología Intel® para llegar a un nuevo grupo demográfico y procesar más de 3 millones de registros por hora.